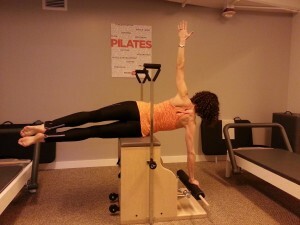 Why We’re Celebrating International Pilates Day! -It’s not just for women. -It’s not just for young, fit people. First of all, just the history of Pilates, throws these misconceptions right out the window. It all began with Joseph Pilates, a former boxer and circus performer who was interred during World War I. During this time he developed a system of exercises for other interred MEN, eventually devising machines for those in need of rehabilitation due to injury or sickness! Just for women? Nope. Just for younger, fit people? Nope! Pilates teaches — people of all ages — flexibility, body awareness, good posture and easy, graceful movements. It focuses on the body’s core muscles, which help keep the body balanced and keeping the spine supported. Pilates can be tailored to fit any client’s fitness and skill levels. The “less is more” theory calls for fewer repetitions, but each one must be precisely executed. By focusing on proper breathing, correct spinal and pelvic alignment, and quality over quantity, Pilates is really a total body exercise with numerous benefits. Students who practice Pilates on a regular basis, will often develop a stronger core, a stronger back, and flat abdominals. In addition, many students will also find they are gaining, long, leaner muscles, and flexibility. Pilates is also a fantastic cross-training exercise for athletes looking to improve mobility, create balance, and prevent injury! Rock Creek Sports Club offers a number of ways for you to give Pilates a try, from small group training, to Pilates Mat classes, and One-on-One Reformer Training. Find out more about the Pilates options at RCSC on on Saturday as we celebrate International Pilates Day from 9am-11am! Check out some demonstrations, meet some of the instructors and learn more!